Now there is a name to conjure with. 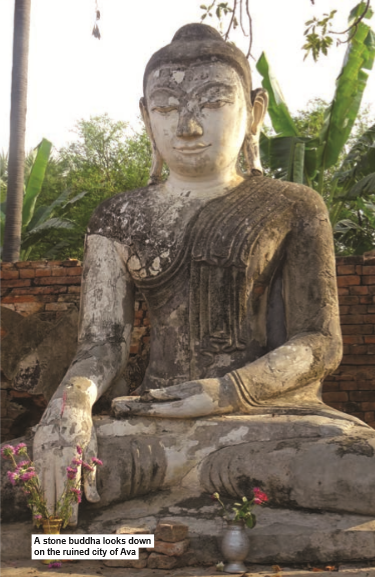 Hymned by Kipling – and Sinatra – Mandalay captures every Westerner’s idea of the exotic East. So does the reality match up to the dream? The city itself, the second-largest in Myanmar (or Burma as we used to call it), is a largely modern transport hub, much knocked-about in the Second World War. But the region to which it gives its name has many treasures, and one of the best ways to see them is by air. The roar of gas burners was the only distraction as we floated through the early-morning mist in hot-air balloons. Beneath, scattered among fields of rice and sesame, lay ancient temples and pagodas in amazing number. 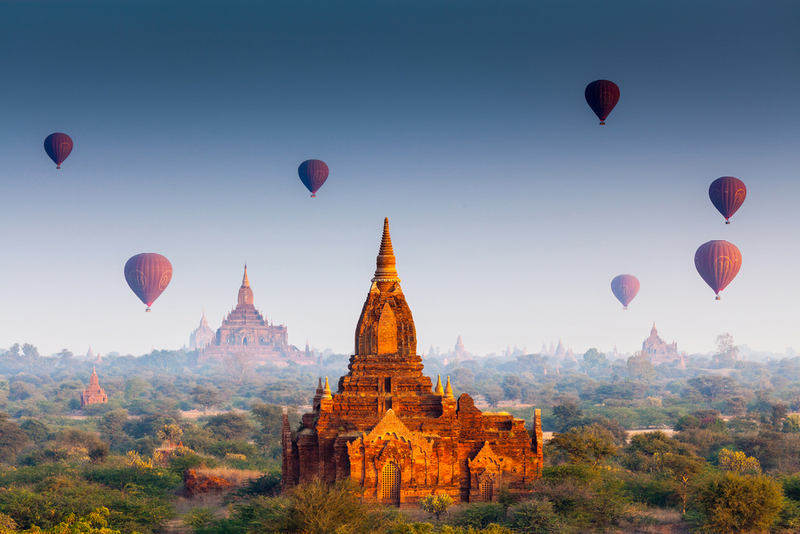 The Bagan district, a 40 square mile area of plains south of Mandalay, once contained some 14,000 Buddhist monuments. Over the years many have been destroyed, by invaders or by earthquakes, while others have simply crumbled as their clay bricks turned to dust. Some were rebuilt during the 1980s, by a military government briefly optimistic about tourism, but much of the reconstruction was tantamount to vandalism (one of the reasons why UNESCO remains reluctant to list Bagan as a World Heritage Site). Yet some 2,000 of these mysterious and beautiful structures remain, and admiring them from above was a highlight of my four-day Irrawaddy river cruise aboard the Strand – an exciting new venture by the famous colonial-era hotel in Yangon (Rangoon). 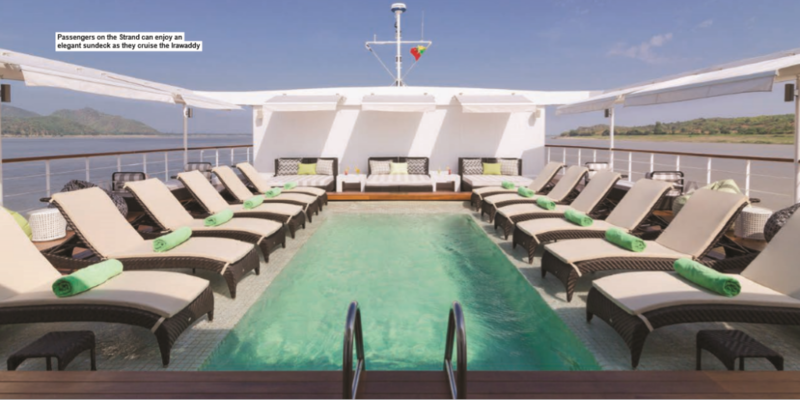 Cruise manager Neville has been poached from rival company Pandaw, and Scott – in charge of food and drink on board and back at the hotel – comes from Scott’s of Mayfair. The 54-passenger ship might be new but I saw no signs of operational glitches, and the 52 crew ensured that discreet personal service kept up the five-star luxury standard. Strand’s intention is to offer passengers a special few days in which all requests are met, whenever reasonably possible. For us that meant an off-the-cuff visit to a local market, a cooking demo of the local fermented tea salad (tastier than it sounds) and a trip to a gem store in Mandalay itself (blue topaz came out tops). These extras were fitted in alongside the planned itinerary and yet we still had time to relax round the pool and enjoy a massage or two. Our first day started with breakfast at the Bagan Lacquer Factory, where young men and women were painstakingly engraving, gold-leafing, weaving and grinding bamboo – along with many other highly skilled operations – to produce some exceptional souvenirs. As well as the balloon trip, we saw wonders such as the Shwezigon pagoda, with its dazzling skin of gold leaf; the Ananda temple, which has been totally restored since the earthquake of 1975; and the unfinished Mingun pagoda with its giant 90-ton bell. 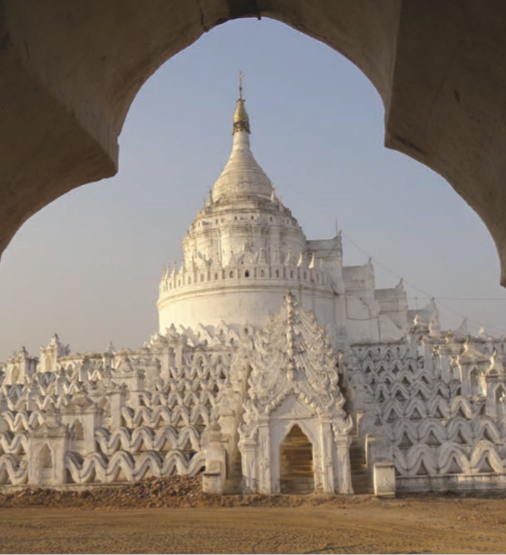 In religious centre Sagaing we visited Swan Oo Ponya Shin, just one of the hundreds of white, silver and gold pagodas and monasteries that glistened in the sunshine. But my favourite outing by far was on the last day in Ava, the ruined imperial capital which has been abandoned since a devastating earthquake in 1839. We were taken by horse and cart to a pagoda where we found three stately stone buddhas but very few other visitors. The stillness and serenity here was quite unlike other sites where crowds of worshippers gather, and it was a sensation I will never forget. For anyone who felt they’d seen enough temples by now, our French concierge/magician Bilou assured us he would organise other activities. One option was a visit to the jade market in Mandalay; another was crossing the U-Bein bridge – nearly a mile long and pure teak from end to end (we watched enthralled as a duck-farmer herded his birds from a canoe on the water below). Wherever we went, young girls and boys would quietly follow, chatting to us in English and selling local crafts for very little. And it was the Myanmar people who helped to make this trip so special. Warm, friendly and always brightly dressed, they welcomed us wherever we went. Back on board we were treated to a traditional puppet show one evening, and a Myanmar cultural show another, with a troupe of dancers and drummers. We were taught how to tie a longyi, the traditional cloth worn by men and women, and how to apply thanaka, a paste made from bark, which is widely used as a sun lotion. But the ship itself was just such a pleasant place to be. Very well appointed and decorated with local art and fabrics, the cabins are spacious and equipped with French windows as well as individual air-conditioning controls. The top deck has a pool, a bar and an alfresco restaurant where a buffet lunch, with plenty of salads and a hot option, was served daily. One deck down, we enjoyed an excellent breakfast buffet and delicious dinners from our Thai chef and his team. Menus were international, including favourites such as foie gras, lobster tail and filet mignon. Despite the brevity of the cruise we were also treated to afternoon tea one day and tapas another, but the best culinary moment was dinner on a sandbank. We returned from a tour to find tables laid and candles twinkling for a night under the stars. It was a truly magical evening, rounded off with dancing and singing by the crew. The Strand Hotel opened in 1901 and at one time was under the same ownership as the famous Raffles Hotel in Singapore. Rudyard Kipling, Somerset Maugham and Earl Mountbatten of Burma all stayed here, but the hotel fell on hard times during the Second World War when it was taken over by the Japanese and used for stabling. Salvation came in the early 1990s when the building was renovated as an all-suite hotel, and since then it has attracted an international celebrity clientele including the likes of Mick Jagger, Pierre Cardin and Oliver Stone. Visitors to Yangon whose budgets won’t quite stretch to one of the hotel’s 32 suites can still enjoy its atmosphere by taking cocktails in the wood-panelled bar during Friday-night happy hour. 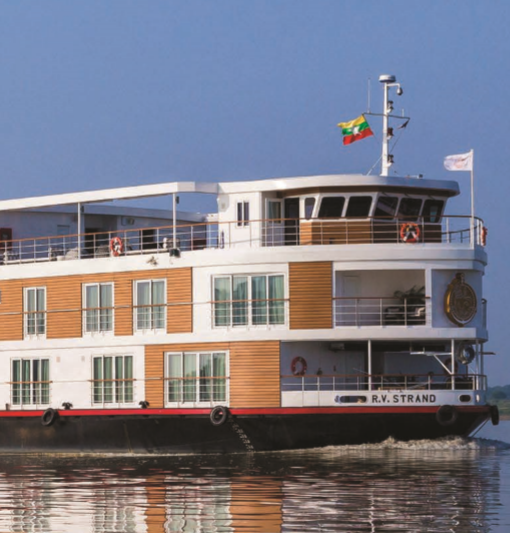 Four nights’ river cruise Bagan-Mandalay plus two nights at The Strand hotel Yangon from £3,100pp, based on two people sharing. Price includes all return international and domestic flights, airport transfers in Myanmar, a city tour of Yangon and all excursions on the Strand cruise.